Meet Packers Players Up Close and Personal! 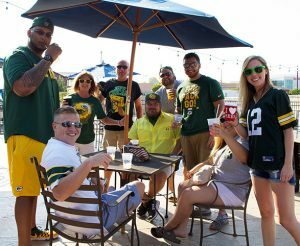 Enjoy delicious hors’ d’oeuvres and cocktails while you meet Packers players, get their autographs and professional photos taken with them! Sports expert and radio personality Chris Havel also digs into the hot topics with the players with an exclusive question & answer session. Reception is included with our Gold Package, also available by itself or as an add-on to any package! Kick-off an exciting day of football by attending our World Famous Tailgate Party! With 2 different tailgate party options to choose from, Event USA has your pre-game needs handled! Unlimited food, drinks, music and fun PLUS meet *ANTONIO FREEMAN! * Please note that Antonio Freeman is scheduled to appear at our home game tailgate parties throughout the year but that on occasion, based upon other now unforeseen scheduling conflicts, he may not appear and in his place another veteran Packers player will be there. Celebrate 100 years of Football! The 100 year celebration in Green Bay will take place on the weekend of September 7th with festivities throughout the city, a FREE concert, and a nationally- televised season opening game against Chicago on Sunday evening. Packers alumni players will be in town and a HUGE ceremony will take place during halftime of the game. Game tickets in any location, in any quantity you need! Complete weekend packages with hotel, only a few left so act fast! Two levels of special edition pregame Tailgate Parties at great values! 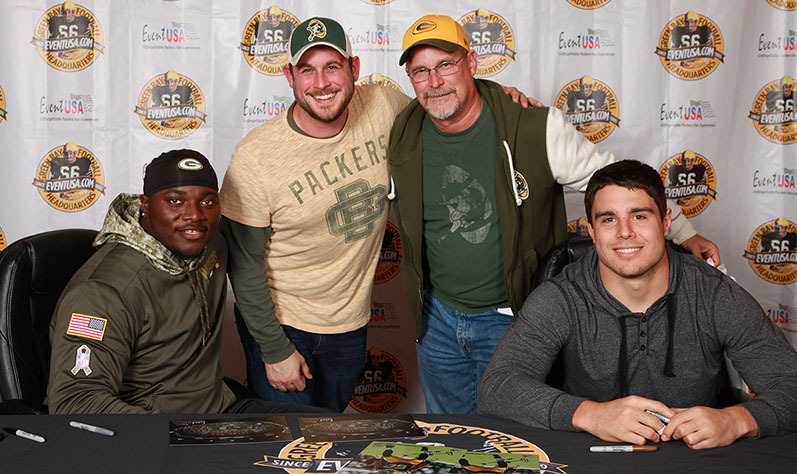 Meet Jake Ryan and Blake Martinez on Saturday evening at our special fan reception, including autographs, photos of the players food and beverage and more! Don’t miss the green and gold celebration of the century!